SAN DIEGO – There is an NCAA tournament postgame tradition in which a jumbo cardboard bracket is hauled into the winning team’s locker room, and a representative of that team peels off a sticker with its school name to show the team advancing to the next round. For the first time in school history, the Marshall men’s basketball team huddled around that bracket. The Thundering Herd’s head coach, Dan D’Antoni, placed the sticker on the Round of 32 as his players jumped up and down and roared with delight. Indeed, Marshall became the 28th No. 13 seed since the field expanded to 64 teams in 1985 to defeat a fourth seed in the Round of 64, an 81-75 triumph against Wichita State on Friday here inside the Viejas Arena on the campus of San Diego State University. Marshall next plays this Sunday at the same tournament site, and will go for its second NCAA tournament win in school history. The Herd had been 0-5 in its five previous trips to the Big Dance. The Herd (25-10) overcame a 7-point deficit early in the second half to shock the Shockers, an American Athletic Conference team that finished the regular season ranked No. 16 in the Associated Press Top 25 poll. Marshall trailed by 1 point, 70-69, with 4:54 left before outscoring Wichita State 12-5 the rest of the way. Junior forward Ajdin Penava had the go-ahead basket with 3:50 left, and then true freshman guard Jarrod Westnailed a 3 to make it 74-70 with 3:10 remaining. A steal and dunk by C.J. Burks made it 78-72 with 2:00 left, before the Shockers pulled within 3 points, 78-75, on a 3 by Conner Frankamp with 46 seconds left. Wichita State, coached by former MU assistant Gregg Marshall and assisted by former Herd head coach Donnie Jones, never scored again. In the home stretch, there were several long delays to determine possession and time on the clock, and the energy in the packed arena had the young Herd roster bubbling over with excitement. Elmore, a first team All-Conference USA selection and the C-USA tournament MVP, put on a show in front of a nationally televised TNT audience. He tied the school record for points in an NCAA tournament game with 27 (Cebe Price, 1956, vs. Morehead State), making 6 of 13 shots and 4 of 8 from 3-point range. He also had a team-high four assists. Penava scored 16 points and grabbed a team-high eight rebounds before fouling out. Burks added 13 points and freshman forward Jannson Williams added 10 points and seven rebounds. The lead changed 14 times and was tied six times. West opened scoring with one of his two 3-pointers, and the Herd and Shockers exchanged blows from there. While Elmore electrified the arena and nation with an array of spin moves, deep 3s and dazzling passes, there were a pair of alley-oops in the first half that generated buzz on social media. Williams was on the receiving end of a pass from West to make it 18-12, Herd, early in the first half. Then, Watson elevated for a difficult two-handed alley-oop on a pass from Elmore that made it 26-21 with 6:54 left of the first half. Now Marshall will hang around San Diego for two more days and try to make it to the second weekend of the three-week for the first time in school history. 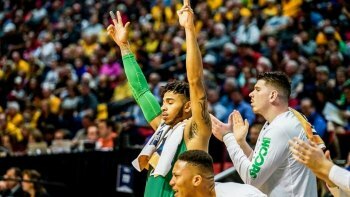 A lack of precedent hasn’t thwarted this Herd team’s quest, though, as the program has won 25 games for the first time since 1986-87, reached the NCAA tournament for the first time in 31 seasons, won its first Conference USA championship and, now, the program’s first NCAA tournament game.